Yahoo has announced that it now has updated it DMARC (Domain-based Message Authentication, Reporting, and Conformance) Policy. In simplest possible terms e-mails sent from an Email service provider such as aWeber, that have a From Address which ends in @yahoo.com will be processed as a bounce. Yahoo rationalizes this by citing that the From Addresses which is binded to its yahoo.com domain but not sent from one of its IPs could be an attempt by the sender to pose as a legitimate company in attempt to fraud someone, a process known as phishing. Though Yahoo means well, the update will have ramifications for many email marketers. Even if you follow sender best practices and people love receiving your emails, you have to make an adjustment or prepare for a drastic loss in email marketing ROI. If you use a yahoo.com From Address for email marketing campaigns, stop. Frankly, it’s something that should have been done a while ago. Use a domain that you control, preferably the same one tied to your website. If you don’t know how to get an email address for a domain you control, contact your domain registrar, such as GoDaddy or 1and1. 1. Who will this affect? At this point, only Yahoo users are affected. It’s best to use a domain you control for your From Address because other webmail providers could follow Yahoo’s lead. Update (4/24/14) — AOL has followed Yahoo’s lead and has implemented a DMARC reject policy of their own. Using an aol.com, aim.com, or cs.com From Address in your Sender Property will significantly reduce your deliverability. We strongly encourage you to use your own domain. Yahoo controls a third of the webmail market. That means Gmail, Outlook and other smaller competitors will monitor the change. If it works, they may follow in Yahoo’s footsteps. Besides, by not having your own domain in the From Address, you’re losing out on a branding opportunity and an SPF record, which improves email deliverability. 2. How do I change my From Address? 3. Will the change affect people who have their own domain, but send to Yahoo addresses? Those senders have nothing to worry about. Yahoo’s new policy impacts only those sending from a yahoo.com address. 4. What about emails sent post update? Has the status of those contacts been moved to bounce? Your contacts are fine. They did bounce, but they have not entered a bounced status. Vocus adjusted to the change quickly, helping to maintain the integrity of your contacts. There are essentially 2 methods, one is simpler to set up and the other requires additional steps. Now, you have to create an additional filter. These filters MUST be applied in this order. If you created them following the instructions above, this should be the case. 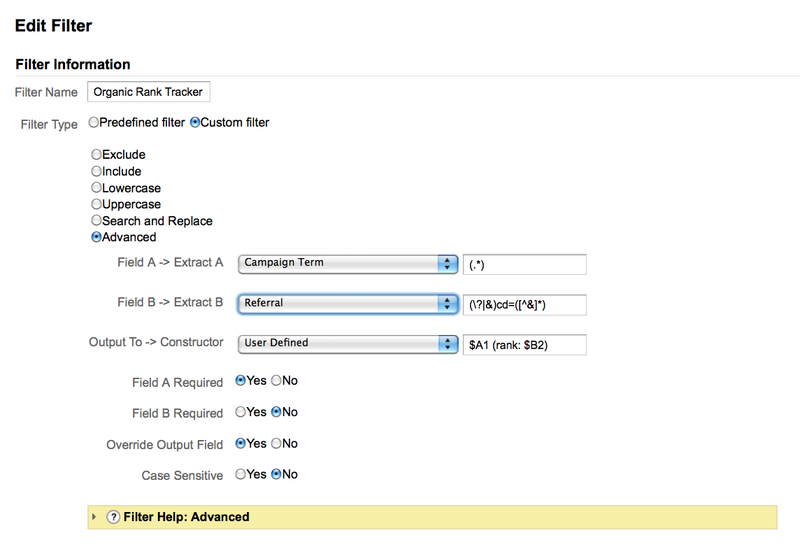 If not, look in the main filters tab in Analytics and click Assign Filter Order. Filter 1 must come before Filter 2. If you’re having a problem. Having the ranking data in Analytics is pretty slick and very helpful, but do you know what is even more helpful? Creating Advanced Segments to break things out in a way that is more meaningful to business people. For example, you should create an Advanced Segment that allows you to visualize traffic from your keywords bucketed by ranking – all number one keywords vs. keywords in position 2-5 vs. keywords 6-10 vs. keywords 11+. Note: Google Analytics filters only work moving forward. They cannot be used to analyze historical data. 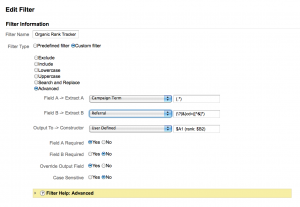 Any time you add a custom filter, you probably want to create a new Google Analytics Profile. This is done to prevent anything from messing up the data you may be using for existing reports. At the very least, do this initially to make sure that the filter works properly. Once you know things are good, you can go ahead and add the custom filter to your preferred GA Profile (although we still recommend using a new profile moving forward). If you still need help after reading this, drop us a line. Best time to get inTouch. Please also include any other relevant information.